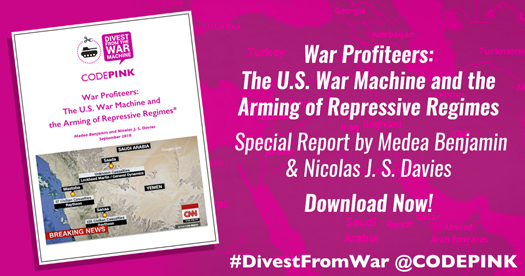 A new report produced by the peace group Codepink covers how U.S. military weapons, contractors, arm repressive regimes indicts the Egyptian military for using American-made arms to overthrow a fledgling effort at democracy by the Egyptian people in 2011. The army massacred, one report suggests, as many as 2,600 Egyptians in Cairo’s Rabaa Square. This was called the deadliest massacre of peaceful protesters anywhere since China’s massacre in Tiananmen Square in 1989 and the White South African apartheid regime’s 1976 slaughter of as many as 700 Black Sowetan school children. The report is titled “War Profiteers: The U.S. War Machine and the Arming of Repressive Regimes.” It says the military-industrial complex fuels endless wars for corporate profits and includes five of the largest U.S. weapons manufacturers and their arms deals with Saudi Arabia, Israel, and Egypt. The military weapons manufacturers include Lockheed Martin, Boeing, Raytheon, Northrop Grumman and General Dynamics. A case in point: On top of having extensive ties with Israel and being a major arms supplier to Saudi Arabia, Raytheon was awarded a $9.9 million contract via the U.S. Department of Defense to assist Egypt in researching and developing technology to “detect tunnels between Sinai and Gaza. Raytheon called this their ‘Seismic and Acoustic Vibration Imaging program,’ ” which used lasers to detect vibrations in the ground and reveal the location of tunnels. “So it’s important to understand that while we were selling to countries that violate international law, it is also a violation of our own domestic law, which says we can’t sell to countries where war crimes are being committed,” she added. The United States is the world’s largest exporter of military weapons, and its weapons industry represents the world’s largest weapons manufacturing industry. In 2015 U.S. global weapons signing deals were for $40 billion, far ahead of France, the world’s number two weapons dealer with $15 billion. The U.S. is one of the only countries in the world with a military large enough to support a private weapons industry. This is because of its large budget, only second to Social Security. Estimated military spending is $892 billion a year. That’s from the spending bill signed by President Trump on Aug. 13, 2018. It covers the period Oct. 1, 2018 through Sept. 30, 2019. That is why war, or military action often wins out over negotiations. The State Department, the U.S. government’s chief negotiator, has a budget of a paltry $28.3 billion. 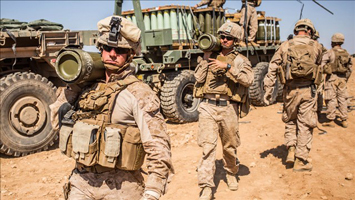 According to the Congressional Research Service, last year Egypt received $1.4 billion in foreign assistance from the U.S., much paid in military weapons. This year the president is requesting the same amount in military and economic aid to Egypt. Benjamin told The Real News Network that during the Obama years, the administration became uneasy seeing American troops coming home in body bags. She continued, “As he had promised that he was going to wind down the wars, it moved into a different kind of war making. And it’s not only the use of drone warfare special operations, but it’s also using proxy wars,” or contracting out U.S. military operations. This removed the American public’s shared experience “in which citizens see the consequences of war illustrated by departing troops in uniforms and flag-draped coffins,” according to sociologist Katherine McCoy, writing in Contexts magazine.